The story is quite funny really. As you know I have been testing the Birkin Jeans, which call for stretch denim. There is all manner of denim available in shops and on the internet but I could not find what I wanted. I wanted light blue, like it is faded, not light blue like it’s middle aged Mom jeans. Plus stretch. Know what I mean? I made nice deep blue ones (and yes, I am wearing them below), but I thought for summer, and especially for my SWAP I needed the lightest shade – a bit like a blue sweet pea. It’s a bit of a cheat as my Mother’s garden didn’t have any blue ones, but they do exist! So for my Summer Sweat Pea swap I had the idea of getting some white stretch denim, and dying it myself, with indigo. Good plan? I thought so! 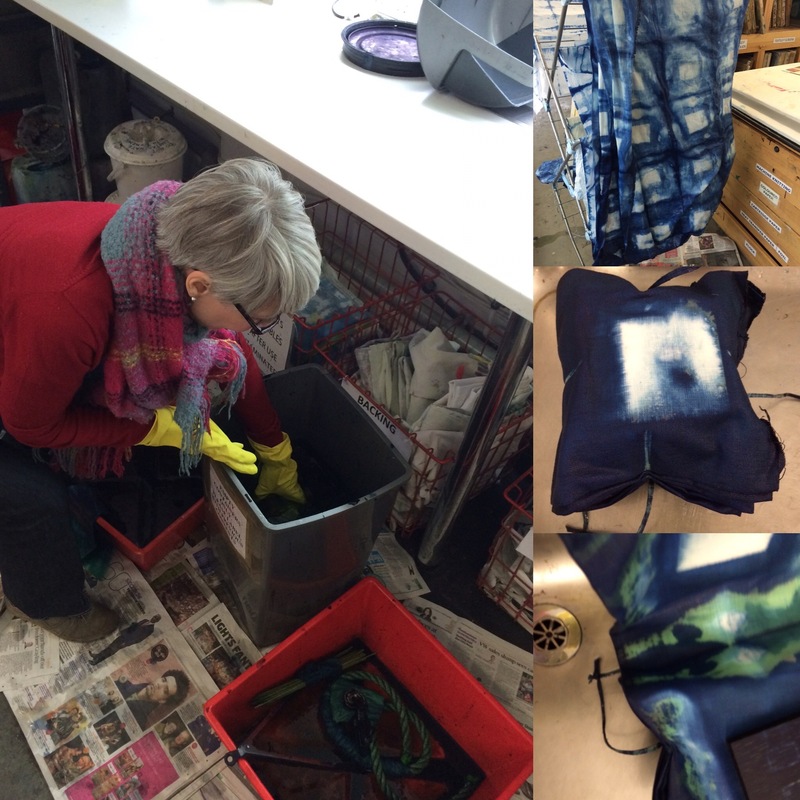 I was thrilled to bits to find an Indigo dyeing class, in London, at Morley college – a full weekend for £80. 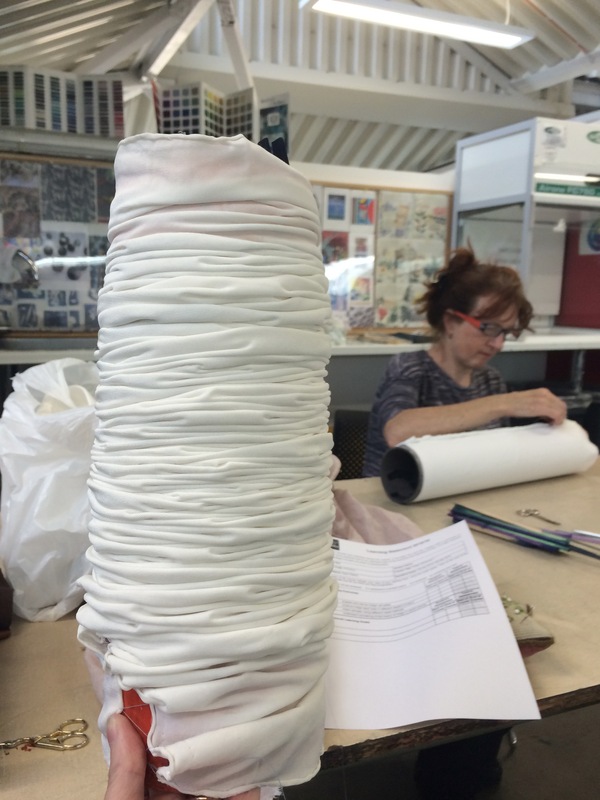 I booked the course and ordered 2 metres of white stretch denim from Favourite Fabrics. A few days later Joe wrote a very apologetic email to say the batch of white was faulty. He agreed to send me the 1m they used for photography, free of charge, so I could test it. Nice of him, but it arrived a day late. Anyway I attended the course which was great. I dyed lots of fabrics, mainly using Shibori (tie die) techniques. I also got my wax pot out overnight and prepared a range of pieces for dyeing. Have you ever used indigo? I hadn’t, but of course it’s in our jeans! I made about ten pieces over the two days. I was really happy with how the velvet scarves turned out. I made one by scrunching it on a plastic pipe; one was sewn with a large basting thread and gathered and one I tried to Ombre by dipping it in the vat over the day. This turned into the scarf on the right. The one in the middle I tried to do an ombre effect – which was so-so. The one on the left is created by sewing two lines of machine stitches and gathering them up tightly. I really liked these scarves and will find it hard to give them away as Christmas presents. Here are some hints if you are thinking of doing this at home. You must wear rubber gloves because the dye is alkaline and burns and dries your skin. A pair of very long gloves is handy to reach into the vat although you can have your work on a piece of string so you can pull it out. To build up a darker colour let the dye oxydise, then put it in the vat for a second (and subsequent) coat. I am not sure when I will make these fabrics into garments but you can be sure I will write them up when I do! There’s a place here that offers indigo dye workshops as well. I’ve been considering taking one. It’s such a lovely colour — or series of colours. I like the velvet. I can’t believe you did velvet! That looks like fun. I’m going to Japanese in March and hope to do a Shibori class in Koyoto. Lucky, lucky you Gail. I really enjoyed Japan when I went. Next time I will try to do something more fabric oriented. I like the fabrics you ended up with. Its years since I’ve done any tiedye or batik, thanks for great tips on the indigo process. Looks great fun. I really like the effect created by sewing the lines. That looks like it was an interesting course. I really wish I lived within easy reach of Morley – it’s not always possible to invade my daughters flat for courses. Enjoy your dyed fabrics. Sometimes, I want to be in your life, Kate. This looks like so much fun (though I can’t believe you sewed chickpeas to fabric. That looks like a LOT of chickpeas. Two packets. Or rather one of chickpeas and one of haricots. A dream of mine. I bought a kit for indigo dyeing two years ago–and it is still sitting on the shelf. But you haven’t told us about the jeans fabric. Will it work? The fabric arrived too late to test but the tutor said that cotton with polyester will work but less well than pure cotton. The jeans fabric I got has about 30% polyester so it should be fine. Probably OK as I want a lighter shade. I am not allowed to make a batch at home as we don’t have a garden, but I might just get some and take it to my Mum’s for Christmas. I love the colour (s) and the effects you have produced. I would use clothes pegs and cable ties to speed up the tyeing (the more expensive cable ties with levers to open them up) but I don’t think I’d be allowed to do this at home! How much rinsing was required for the dye to be safe against the skin? I rinsed it under a running tap until it ran clear. Then I brought it home and chucked it in the washing machine. It is not completely fast and some colour came out at this stage. But now it seems very stable and the chemicals have all been washed away. Looks like a lot of fun! My oldest self-made jeans are about 2 years old, and they have faded significantly from when I made them. I still have scraps around so it’s easy to compare. Maybe you’ll find that your darker jeans eventually become the colour you’re hoping for! I imagine that indigo dying is something that I would try as a workshop, but I can’t imagine ever doing it at home. Do you think you’ll try it on your own? I think, now it has been demystified for me, I could easily do this at home. I wrote this post to encourage others to give it a go. I am short of outdoor space here (well space in general), so it may have to wait until we move house. What fun! It’s OK to hold on to fabrics you’ve dyed yourself for as long as you want to just admire whenever you care to. They don’t need to be made into anything. They are beautiful unto themselves. Enjoy your work for what it is, wonderful! I have seen the exhibition, and reviewed it, and yes and the indigo dress at the start was just perfect, I thought. I am hoping to do a really, really low tech version in my Mum’s garden. I bought the dye and additional ingredients for £17 from Kemtex, so I will let you know how I get on. I’m booked on an indigo dying course here but it’s not until April next year! I don’t think I’d try it at home but your results are inspiring. It’s a bit of a wait but it is worth it Ruth. You will have time to collect fabric and get inspiration. It is such fun. I have ordered some supplies from Stuart at Kemtex and will try to do it at my Mum’s house (garden) over Christmas.